Luxury Vacation Paradise - 2BR/2BA 1st fl - Renovated WiFi Private Beach Access! Imagine relaxing in this newly renovated unit while you enjoy your new large kitchen with white cabinets, granite countertops and stainless steel appliances. Bathrooms with granite and beautiful tiled floors. A living area with new bright furnishings, and luxurious tiled floors. These are just some of the highlights...the only better thing than reading this is staying there! The unit is located on 14 beautifully landscaped acres on the bayside of Siesta Key. 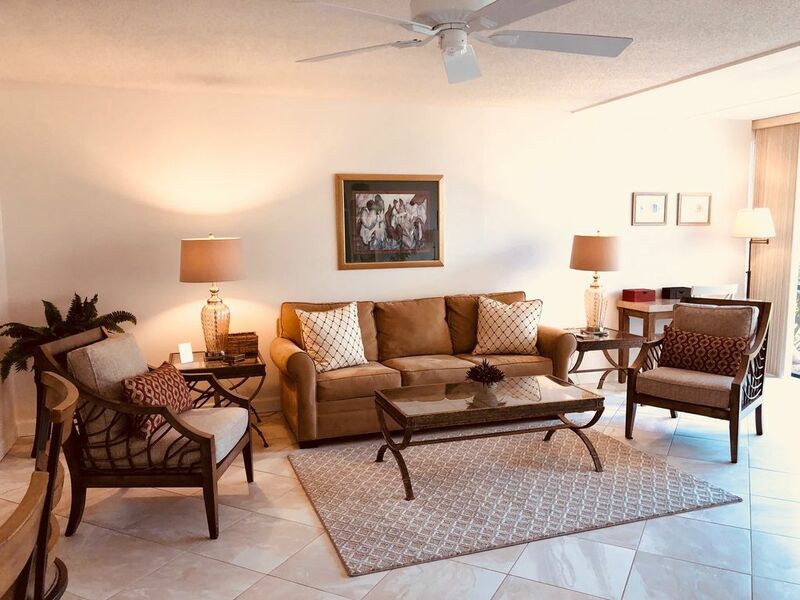 The unit is among the closest (approximately 110 yards) to the private beach access leading to the white, powdery sands of Crescent/Siesta Beach. Enjoy the world-renowned #1 white sand beach in America - Siesta Key Crescent Beach. Enjoy walks, shelling, and the Drum Circle every Sunday evening. The festival celebrates the magnificent sunsets over the beautiful Siesta beach. Wireless (Wifi) - Widescreen HDTV - TiVo - All Included! This Bayside, first floor condominium is conveniently located in Midnight Cove II with private beach access. This beautifully renovated luxury unit has a large living space and sunny lanai complete with eating area. Just minutes from bustling Siesta Village. The professionally landscaped grounds, heated swimming pool, tennis courts, and bicycle racks are convenient to your doorstep. Relax in this two bedroom, two full bathroom condo equipped with three flat screen TV's, a full kitchen with dishwasher and full-size refrigerator, WiFi (wireless), DVD, and TiVo (DVR). The living area is beautifully appointed with luxurious furnishings including a desk area. Enjoy the aqua blue water of the Gulf, white sands for walks and stunning sunsets. This condominium complex is family friendly and a wonderful destination for a relaxing vacation. You just won't see a more beautifully renovated unit! We have truly focused on making sure that your stay is wonderful and restful. Beautifully decorated with granite and tile! Direct view of of peaceful Lagoon. Just completed a week-long trip to Siesta Key with my family of five (three young children). The condo was clean and recently renovated--everything was as reported. Closet for beach gear was super convenient, and the 5-minute walk to the beach was amazing! Our kids also loved the pool. We had a couple questions and the owners were super-responsive and helpful over email. We cooked most nights and the kitchen is completely stocked with cookware/flatware/silverware. Target, Costco, Publix all within 5-10 minutes to stock up on food, although there are great restaurant options on the island and in Sarasota if you'd rather. Completely satisfied with the property. Would recommend to anyone. Owner is very easy going and helpful. We stayed at this property in August 2018 and just absolutely loved it. The communication with the owner throughout the entire process was very easy. Condo was gorgeous and completely updated. Would highly recommend staying here. This really is a beautiful place to stay. The main living space, in particular, is lovely - very spacious, airy, light with quality furniture. It's all very well looked after and the kitchen is incredibly well kitted out. It's just short walk from a small supermarket and several restaurants - not to mention the fabulous beach! We were impressed that the owner gave us a call during our stay just to check how things were going and if we needed anything. We would highly recommend to others! Beautiful unit and conveniently located near the pool and beach access! My family and I rented the unit for a week in July and couldn't have asked for a better vacation home. The unit is beautiful and very spacious. It is conveniently located near the pool and beach access. It comes with everything you need for a relaxing stay. The owners are very nice and accommodating as well. I would definitely rent from them again! The updates of the property are nice, however there is no place to hang wet towels and swimsuits. The towel bars in both bathrooms were not usable. Another issue was: no laundry in our unit. There was laundry availability on property which the guests have to pay to use. I felt that should be included in amenities. Rates and availability are subject to change. The Guest must agree to the terms and conditions outlines in the rental agreement. Please note that our cancellation policy is 90 days and not 60 days. Due to limitations on the VRBO site it erroneously specifies 60 days.